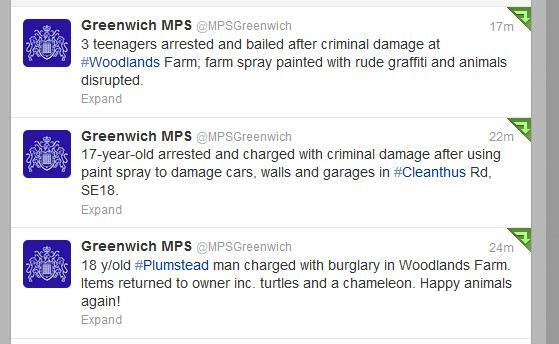 Greenwich Borough MPS, @MPSGreenwich, reported in twitter updates this afternoon that they had arrested three teenagers in connection with the vandalism at Woodlands Farm last week, and that they had charged an 18 year-old man with burglary. Stolen personal items had been recovered and returned to their owners. Good work by the police, and quick! Glad the Police caught at least some of the utter scumbags involved. Hope they catch the rest and punish accordingly. A couple of years of unpaid dung shovelling at the farm should fit the bill. Next PostNext A Murder of Crows?